This information is being revealed in advance of the 2012 NAB Show in Las Vegas next week, where the company is planning to make a really big splash with these new tools. Adobe CS6 Production Premium introduces a sleek, fresh editing environment in Premiere Pro – the hub of your post-production workflow. Freely iterate creative ideas with the new Content-Aware family of technologies in Photoshop Extended and with new 3D advancements in After Effects, where the Global Performance Cache lets you work as fast as you can think. New components – Adobe Prelude, a logging and ingest tool, and Adobe SpeedGrade, for color grading and finishing (originally published by Iridas) – offer superior solutions to common production challenges. Adobe Audition adds dozens of enhanced editing features and support for control surfaces so you can produce audio more efficiently. From planning to playback, CS6 Production Premium gives you tools that help your workflow. Sleek Adobe Premiere Pro user interface – See more of your video and less clutter, thanks to an efficient, highly intuitive interface featuring customizable Project panel views, transport controls, Audio Meter panel, and track headers. Play clips directly in the Media Browser. Global Performance Cache in After Effects – Create more in less time. Adobe After Effects intelligently optimizes and preserves your previews by taking full advantage of the 64-bit power in your computer’s hardware. Now you can beat deadlines instead of waiting for frame updates. Photoshop imaging magic – Retouch images with the new Content-Aware family of technologies. Experience fast performance when working with large files using the new Mercury Graphics Engine in Photoshop CS6. Creative tools in After Effects – Extrude fully ray-traced text and shapes natively while adding reflections, environment maps, and more. Track elements in 3D space with depth of field, shadows, and reflections, and apply 3D track points to 2D footage. SpeedGrade for crafting the perfect look – Manipulate light and color. Broad format support includes raw, HDR, and stereoscopic. Apply precise HDR grades to source, or import sequences from Adobe Premiere Pro for more in-depth color grading. Faster audio editing in Adobe Audition – Get high-performance and intuitive audio editing. Powerful new tools such as automatic audio alignment, real-time clip stretching, pitch and speed control, and control surface support help you deliver projects faster. Logging and ingest in Prelude – Ingest nearly any file-based format and begin logging immediately with searchable temporal markers that flow through post-production, enabling you to work faster and stay organized. Creative enhancements in Adobe Premiere Pro – Take editing in new directions with adjustment layers to apply effects to multiple clips, expanded multicam editing, and the redesigned Three-Way Color Corrector. Send sequences to Adobe SpeedGrade for more in-depth color grading. Stabilized footage without rolling shutter – Remove unwanted camera movement with GPU-accelerated Warp Stabilizer in Adobe Premiere Pro. Rolling shutter repair, available in After Effects and Adobe Premiere Pro, eliminates wobbly artifacts. GPU-accelerated performance – Speed up your workflow thanks to support for MacBook Pro OpenCL-based GPUs and NVIDIA Maximus configurations provided by the Adobe Mercury Playback Engine in Adobe Premiere Pro. Plus, get GPU-accelerated features in Adobe Photoshop, SpeedGrade, and After Effects. Expanded format support – Edit anything. New support for ARRIRAW, RED EPIC, and RED Scarlet-X adds to the extensive list of natively supported formats in Adobe video and audio tools. Interoperability with third-party tools – Preserve your creative intention with high-fidelity exchange between components of Production Premium and third-party software and hardware. Adobe Story for script development – Develop your scripts from the desktop to speed up the post-production process with Adobe Story CS6. Faster, more flexible Adobe Media Encoder – Quickly and easily output to virtually any screen. Create and organize your favorite presets in the new Preset Browser for faster export and batch encoding in the background. Robust metadata for production management – Enjoy rich metadata support throughout Production Premium for efficient editing and project management. Ingest and log media with Adobe Prelude. Use metadata-rich scripts to track complex productions with Adobe Story. Fast Blu-ray Disc, DVD, web DVD authoring – Send Adobe Premiere Pro projects directly to new 64-bit Adobe Encore without rendering. Speed up your authoring workflow with rock-solid performance and stability. Open and save large and high-resolution projects faster. Q: Why should I switch to Production Premium if I’m using another NLE? A: CS6 Production Premium goes beyond a new NLE, with the full post-production pipeline for virtually any type of production. Tight integration between Premiere Pro, After Effects, and Photoshop expands your capabilities and saves time, and seamless project exchange with Premiere Pro and Final Cut Pro or Avid Media Composer makes it simple to switch. Q: Can you tell me more about integration in Production Premium? A: Premiere Pro is not only designed to let you work easily between the editing timeline and After Effects or Photoshop, with support for a wide number of formats and Adobe Dynamic Link, but it is also part of a full production pipeline. You can ingest and organize footage in Adobe Prelude before bringing it into Premiere Pro, and while working on an edit, you can refine audio in Adobe Audition and color grade and finish in Adobe SpeedGrade before batch encoding the result in Adobe Media Encoder. After Effects is closely integrated with Photoshop and Adobe Illustrator as well. Q: Why should I buy Production Premium over After Effects on its own? A: CS6 Production Premium offers more value for your money than After Effects, without adding premium cost. Premiere Pro supports working with After Effects projects like no other NLE can, and Photoshop and Illustrator are closely integrated with After Effects, which now includes the ability to bring Illustrator vectors into After Effects as Shape Layers. SpeedGrade adds color grading and finishing, and Adobe Media Encoder is a superset of the Render Queue that works in the background. Q: What are the newest components in Production Premium? 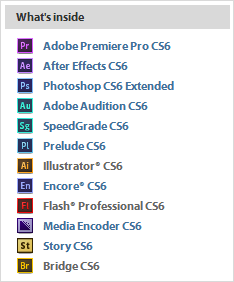 A: CS6 Production Premium includes two entirely new applications. SpeedGrade is a sophis­ticated color grading and finishing system. Prelude is designed for on-set ingest, the addition of metadata, and rough edits that can be imported and improved in Premiere Pro. Prelude is available only in the Production Premium or Master Collection suite editions. Download the Adobe CS6 Production Premium Datasheet. Check out this page for more CS6 walkthroughs in greater detail! Premiere Pro, After Effects and Audition CS6 FAQ and Highlights What’s New in CS6: Premiere Pro, After Effects & Audition Features! 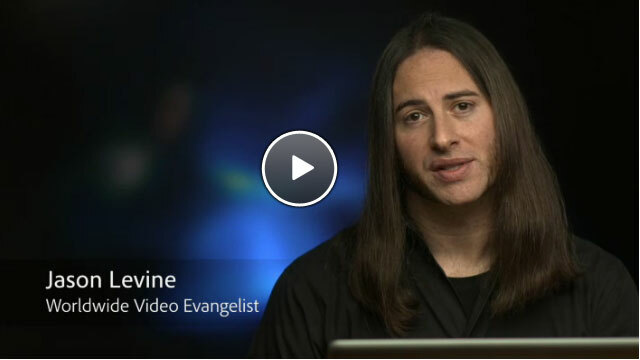 First Look: Adobe CS6 Production Premium Suite — What's New?